But it's not enough that the characters and the locations look their parts. Altman has breathed life into this material, and he hasn't done it by pretending it's camp, either. He organizes a screenful of activity, so carefully choreographed that it's a delight, for example to watch the moves as the guests in Olive's rooming house make stabs at the plates of food on the table. This was an early crucial role for Robin Williams – still known for his TV work as 'Mork' on "Mork and Mindy" – and his first leading role in a movie; unfortunately, it received mixed reviews and was a considered a flop. However it is a triumph in terms of characterization, no matter if the movie was a successful stab at the Popeye comic. Larry Cruz at Hitflix recently wrote, "you could never have asked for a better Popeye than Robin Williams." On a similar note, it has been often observed that 'Olive Oyl' was the role Shelley Duvall was born to play. Oh! Did I mention that this movie is a musical? No! Well, it is! And what a weird musical it turns out to be indeed. Much like a good number of the animated iterations of Popeye, this story features singing, lots of singing, lots of weird singing of weird songs, all of which are surprisingly, strangely, catchy, fun, toe-tappingly fun, and more importantly an oddly faithful representations of these characters and the world they live in. The music is a great example of the overall tone of the film. It’s absurd, quirky, insane, and wholly unbelievable, yet played with such sincerity and humanity that you totally believe it. The director is Robert Altman (''Nashville,''''Thieves Like Us''), whose gentle way with actors and their material never seems quite right for a live-action comic strip. Too often the movie observes the crazy slapstick behavior of its characters as if it were watching them through a telescope. It's interersted but detached. Not until it's well along does the movie share the nuttiness. The casting is one of the strongest elements of Popeye. Veteran actor Ray Walston was cast as Popeye's father. You may recognize Donald Moffat ('The Taxman') from The Thing, or Paul Dooley ('Wimpy') from Breaking Away. Bill Irwin used his clownish physical humor to add the the town's eccentricity as 'Ham Gravy – the old boyfriend'. 'Swee'pea' was charmingly played by Robert Altman's not-yet-one-year-old grandson, Wesley Ivan Hurt. Popeye is one of many films shot on location in Malta. Music and lyrics by Harry Nilsson. Love this movie. Look for Dennis Franz as one of the Toughs. I LOVE this movie.....used to watch it ALL the time and I still catch myself singing the songs...Especially, "He's Large". A Classic. I think a re-watch for me and a first watch for the kiddos is on the table tonight!!! The set still exists in Malta, and is a museum and entertainment complex. I had this movie on VHS as a kid - probably rented from Errols and then recorded onto our own tape - and really liked it. "He's Large" would get stuck in my head because it was drawled out in such a funny way. Off to go watch the clips and see what triggers memories. Robert Altman's grandson is a high school teacher in Missouri? Not sure why that surprises me, but I'm really fascinated by it. It's actually hilarious how hard it is to Google anything about the guy and his family: his mother was Altman's first child but his father was apparently a writer named John Hurt...but not that John Hurt or the other John Hurt. And he has a much older brother who's a filmmaker named Dana Altman. But not the Dana Altman who's the head coach of the University Of Oregon basketball team! And so on. This is a movie that I watched several times as a kid, probably due to my parent's like of Nilsson. And it still gets referenced regularly. "Food food food. Everything is food." I know Dana Altman. Had no idea that was his brother. Will now email Dana to ask about it. In the "Everything Is Food Food Food" clip, watch. There's a shot where the taxman, shortly after relieving Wimpy of a hamburger ("one hamburger chisler's tax!") open the door to the Roughhouse and walks out. Look out that door as he goes. There's a guy out there, with long hair and a beard, in the distance, looking at the camera. He lights up ("Hey!") and breaks for the door as it closes. He appears several other times in the movie too, usually outside a building we're inside, looking in at us or other people. What the hell is up with him?? Anyway, I love this movie. I didn't really understand it as a kid, the visual language is different and odd and that unsettled me, plus I was at the time more familiar with the Hanna-Barbera Popeye cartoons than the Fleischer's, so I didn't understand stylistic references like character voice ad-lib overlays that don't match the action precisely. 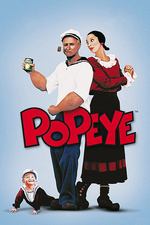 A couple of years ago a friend went on a big Popeye kick where he played the movie almost daily, and I was over at his place a lot at that time for Wii Sports Golf and Tennis*, and bits of this movie seeped into casual language among our circle of friends. One day, when I had a Birdie in a hole on Wii Golf, he tried but could only make it to par, and I said, mimicking Duvall-as-Olive-Oyl's singing in the song: "It's... PAARRRRR." We both cracked up. Another of the things about the movie that I didn't understand growing up is that, while the production and performances are inspired by the Fleischer cartoons, the characters and some of the places come from the comic strip, which is actually its own weird universe rarely touched upon by the movie cartoons, Wimpy and Swee'Pea was about as far as it got. Hanna-Barbera tried using some more of it in their later Popeye cartoons, but still didn't make terrific use. Olive's brother Castor Oyl, for instance, is from the comics. Ham Gravy, the "old boyfriend" is Castor's pal. And after an initial appearance Bluto didn't reappear in the comics for a long, long while. The history of the comic strip is a rabbit-hole that I won't explore here, maybe in a FPP later. Elzie Segar, creator of the strip then known as Thimble Theatre where Popeye originated, died young, and himself produced less than 20 years of the strip, with its breakout character Popeye himself beginning around halfway into that. So after about ten years of founding material, there is far, far more of Popeye created by other people than his originator. * My friend's rank in the original Wii Sports Tennis so so high that the graph that his rating is over 2,000, and the line actually extends up off the top of the graph! Dana says he was in the movie too, for about 38 frames. It was his first film. I think he helped around on the set as well. I want to get stories about Malta from him, but he's just an acquaintance, so I might not hear back. I was just listening to ep. 112 of Harmontown, and there was some sort of anecdote by Jeff Davis about loving the movie as a kid, and later finding out that this was a point in time when Robin Williams was pretty much fueled by cocaine, unable to get it on Malta, and somehow it was arranged for Parisian models to smuggle it in via...er, means. It was surreal anecdote for a surreal movie. This is one of my most rewatchable movies. Love it. Fantastic. Who could hate on this movie? The set is gorgeous! The physical comedy is like ballet. The background actors all look like they are in an equally interesting movie of their own. Such a convergence of many things I love. I aint a physikist...but I knows what matters. The Commandant (Ray Walston) "True I hates, but I come by me hating fair...and square. Hatin's me code. I will live and die by hate. Hate's done me more good than anything in the world. (sings) - its not easy being me....master of me own deskiny." - The wicked gleam, the pure joy he feels in hating. Contagious. And right before he gets mutinied by Bluto. Good stuff. Taxman (to wimpy) "nickel hamburger chiseler's tax"
Wimpy (ditching out on said tax and with hamburger) "i wouldnt pay that. Shocking abuse of power"
"What am I? Some kind of barnacle on the dinghy of life?" During 'Everything is Food' - Bluto sitting upstairs eating a haunch of some beast and snarling like a tiger. Nice touch. JHarris...that caveman looking guy...I am pretty sure he is from the comics. He pops in the movie a couple other places too. Like a hirsute Waldo. Oh and don't forget physical comic Bill Irwin! He was Mr Noodle and I think the alien dog from 3rd Rock From The Sun. What? Why I never! the nerve! I am showing up at Larry's house with an MP3 player and a bottle of hooch to prove him wrong. Not catchy? Harummph. Michael Jeter is literally mind-blowing in The Fisher King. Robin Williams also did another project with Bill Irwin: They were in the Don't Worry, Be Happy video together. That's right maxsparber! I forgot about that. Ye canst inheritz a pipesk! IMDB lists John E. Bristol as "Bear - the Hermit". That must be the guy with the wild beard who shows up in the background. Bear is the first person Popeye sees when he arrives at Sweethaven.